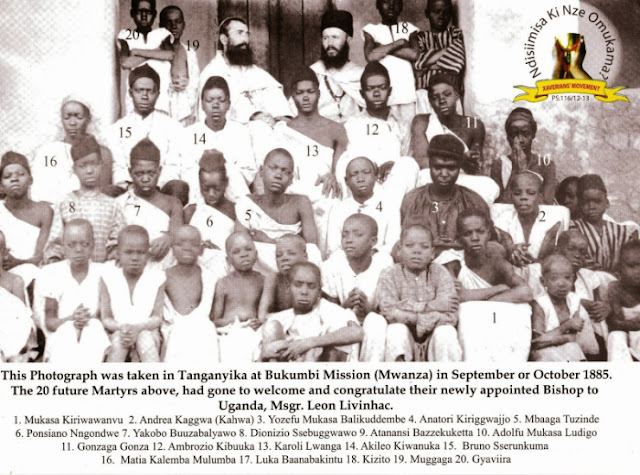 Charles was one of 22 Ugandan martyrs who converted from paganism. Though he was baptized the night before being put to death, he became a moral leader. He was the chief of the royal pages and was considered the strongest athlete of the court. He was also known as "the most handsome man of the Kingdom of the Uganda." He instructed his friends in the Catholic Faith and he personally baptized boy pages. He inspired and encouraged his companions to remain chaste and faithful. He protected his companions, ages 13-30, from the immoral acts and homosexual demands of the Babandan ruler, Mwanga. When Charles was sentenced to death, he seemed very peaceful, one might even say, cheerful. He was to be executed by being burnt to death. While the pyre was being prepared, he asked to be untied so that he could arrange the sticks. He then lay down upon them. When the executioner said that Charles would be burned slowly so death, Charles replied by saying that he was very glad to be dying for the True Faith. He made no cry of pain but just twisted and moaned, "Kotanda! (O my God!)." He was burned to death by Mwanga's order on June 3, 1886. Pope Paul VI canonized Charles Lwanga and his companions on June 22,1964. We celebrate his memorial on June 3rd of the Roman Calendar. Charles is the Patron of the African Youth of Catholic Action.